Perhaps because of the seasoning, or the hardened oil, but these Chips had an almost Kettle Cooked crunch to them. The snap was a cracking break. The Chips did however quickly turn mushy once the eating process began. 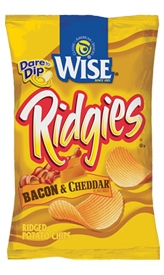 Wise Ridgies are cut very finely and narrow. A number of the Chips in our bag were strangely flat, and oil bubble free. There were also some browning and browned areas of what were mainly whole Chips. There was also some darkish colored seasoning, but it was fairly light in covering. This was very exciting for us at Chips & Crisps. Surveying so many variations of the same flavor gets to the point where we can't honestly predict the right outcome. On one day our review may be just right, on another statements could contradict. This is why we urge everyone to explore the wonderful World of Chips & Crisps to make their own minds up. Anyway, that ramble aside - a new flavor. Brilliant! But was it? Well, it was like a smoky, maybe even hickory flavor with cheese. Smoky Cheese, if you like. The taste wasn't for us, but again, we would urge everyone to try them.